HSMC High-Speed cable allows users to connect two mainboards with HSMC interface together. For example, DE2-115, DE4 and other host boards which have HSMC interface can be connected through this High Speed cable. The HSMC High Speed Cable does not include power signals or JTAG signals, so the cable will not supply power or JTAG chains. The HSMC High Speed Cable might or might not interfere with the component on your FPGA main board. 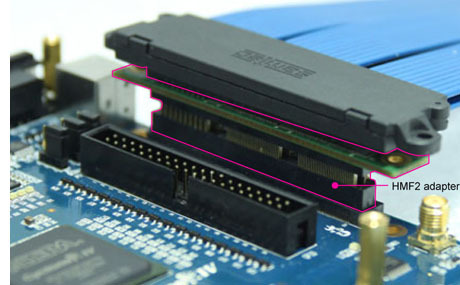 If interfere occurs, you can use Terasic HMF2 to extend the height of the HSMC connector to avoid any obstruction. Please take potential mechanical interference into account before your purchase of the HSMC High Speed Cable. For more information, please contact sales@terasic.com .